These are just a few of the most frequently asked questions we have a come across here at TranPak. If you don’t see the answer to your question, please call us at (800) 827-2474 and we'll be glad to help. How Much do Pallets Cost? This question is a big one and to answer it accurately one must first be sure of the exact purpose of the pallets intended for purchase. The reason for this is that pallets are broadly grouped into two categories, Export & Shipping and Reusable. Prices vary considerably between these two categories based on the manufacturing process, the materials used and the strength necessary for repeated use (or not). Learn more about how much pallets cost. Pallet sizes still vary considerably between different countries although much progress has been made in terms of standardization and reusability. Of the many different pallet sizes available, the International Organization for Standardization (ISO) has approved six pallet dimension which are now widely used around the globe. Learn more about standard pallet dimensions. In material handling the word tote is used to describe a wide range of containers. For example, plastic agricultural cases, plastic liquid intermediate bulk containers (IBC’s), and plastic bulk bins are all referred to as totes. Learn more about what is classified as a tote. What is an Intermediate Bulk Container? An intermediate bulk container (or IBC) is a pallet mounted, industrial grade reusable container that is used for storing and transporting bulk liquids and powders. Here is a good overview of the different types, uses and benefits of intermediate bulk containers. A skid is another term for a single deck pallet, which means it has a top deck but not a bottom deck. Examples of skids include nestable plastic pallets, which have top decks for placing goods onto and undersides that are molded so as to be stackable. Learn more about skids. A four way pallet is one that allows the forks of a forklift to enter on all four sides. In the case of wood pallets, this enables them to be raised by the stringers and so are best suited for heavier loads. Even so, plastic four way pallets offer far superior performance and ROI than wood pallets. They are more durable, have a higher weight capacity and should be considered in the context of your operation. See an example of a four way plastic pallet. What is a Two Way Pallet? A two way pallet is one that allows the forks of a forklift to enter on just two sides. In the case of wood pallets, this means they are raised by the deckboards and are better suited for lighter loads. However, there are plastic two way pallets available with a much higher weight capacity than wood. This allows your product to arrive in better shape and still be cost competitive. 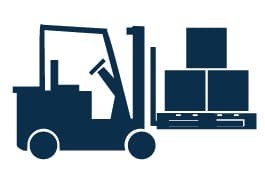 Dynamic Capacity refers to the maximum load capacity of a pallet while it is in transit on a forklift. 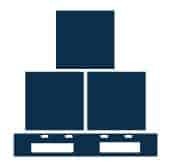 Static Capacity refers to the maximum load capacity of a pallet while on the floor. What are the Benefits of Export Shipping with Plastic Pallets? Due to ISPM 15 regulations, all wood pallets must be heat-treated or fumigated and stamped with a mark of compliance. Fortunately, plastic pallets are exempt from all ISPM 15 regulations. Read more about the benefits of plastic pallets in export shipping. ISPM 15 stands for the International Standards for Phytosanitary Measures No.15 (ISPM No.15). They are a set of regulations that were set up to help prevent the spread of pests and diseases through the use of wood in packaging materials used in international trade. Read more about the regulations of ISPM 15. GMA stands for the Grocery Manufacturers Association. They recommended a standard pallet footprint of 48"x40" which is known as the GMA pallet. Learn more about GMA pallets. Rotomolded is another term for the manufacturing process known as rotational molding. It is a method that has long been used to form a variety of plastic objects and products. An example being TranPak's rotomolded plastic bins. Learn more about rotational molding. Injection molding is a process used for manufacturing products or parts by injecting molten material into a shaped mold or die. It is best suited for high volume manufacturing of standardized products. Read more about injection molding. Structural foam molding is a process that allows manufacturers to produce very large structural parts. This method can be accomplished with much less pressure and cost than other methods but there are factors to consider. Read more about structural foam molding. Thermoforming is a plastic molding technique that results in a variety of highly usable products. During this manufacturing process, thin plastic sheets are heated in order to make them easy to manipulate. Read more about thermoforming. Compression molding is the process of molding in which a preheated polymer is placed into an open, heated mold cavity. The mold is then closed with a top plug and compressed in order to have the material contact all areas of the mold. Read more about compression molding. What are the FSMA Regulations? The Food Safety Modernization Act or FSMA, became law on January 4, 2011. The goal of the FSMA is to ensure that the U.S. food supply remains safe by focusing first on prevention rather than just responding to contamination issues. The Food and Drug Administration (FDA) has been granted new powers by the FSMA to do this. These powers include being able to initiate mandatory product recalls and to assist with the regulation of how our foods are grown, harvested, processed, and stored. Read more about the FSMA regulations.